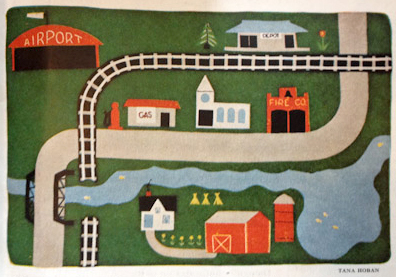 Felt Town was the name given to a style of children’s rug play that Marilyn McCourt (aka Gram) discovered while browsing the November 1951 issues of Ladies Home Journal. After reading an article that described a home made felt children’s decorative play rug which would unlock a child’s desire to discover the world of miniature planes, trains, boats, animals and just about anything else, she set to work on her own version. I came across the concept upon meeting and then marrying one of Gram’s grandchildren who also made a Felt Town in 2009 and became enthralled with the concept of a magical world right there on the floor. This website is devoted to the understanding, preservation and discovery of all things Felt Town related. There were four original Felt town’s made (we think) and no one knows how many more exist outside the McCourt circle. This felt play rug of a small village inspires a stimulating game for youngsters from two to ten. It is a game that children can play together or by themselves. This rug has been designed for easy sewing. It measures 36″ by 54″. It is simple appliqué stitch of felt on felt. We have arranged for you to buy all the materials (two layers of green felt for rug and all necessary amounts of other colors used in the decorations) in a complete package for $8.95 from Fun-With-Felt, 215 Middle Neck Road, Great Neck, N.Y. Send for Journal Pattern No. 2584, 25cents which includes chart and instructions for cutting and making. Use coupon on Page 26. 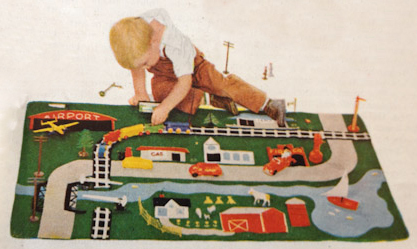 Scaled for dime-store toys,, the rug can be equipped with everything from lamp posts to animals on the farm. Boats, fire engines and planes also have their places. Here is the article as it appear in color and ready from printing.